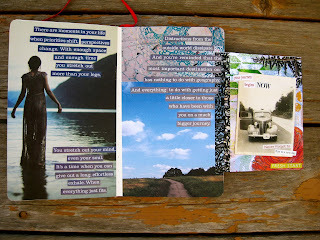 honest heART studio: Magazine Collage mini-class with When Frogs Sing! Magazine Collage mini-class with When Frogs Sing! I am so excited to let you know that Rhomany at Rhomany's Realm has invited me to do a mini-class as part of her When Frogs Sing 2016 course. This is a stand-alone class meaning that you do not have to sign up for the whole When Frogs Sing course (you totally can if you want to of course!). All that you need to do is do the free registration at Rhomany's Realm to be part of the forum and then you will be able to register for my mini-class. During the month of July, Rhomany has invited three guest tutors, including myself, to host mini classes as an add-on to her When Frogs Sing course. Anna Brim aka Mrs. Brimbles and Clare Horner aka GotPaintInMyHair will also be offering special workshops during the month. I almost hate calling this a mini-class because it's not going to be mini like that at all! I am so excited to have been given the opportunity to share my love of collage in a classroom format. This is the first time that I have ever gone through my entire collage process from beginning to end and I have so much to share with you. Each video has been recorded in real-time as I go through each subject step-by-step. So far I will be having 6 videos, which includes an introduction video, and I might surprise you with a bonus process video as well! My workshop will be live and run July 11th-15th of 2016. You are also able to sign up any time after that week until November 30, 2016. You will have "forever" online access to the videos with the option to download them if you choose. The classroom is in a forum so you will be able to ask me questions, get to know other students and share photos of your creations under each days topic. ***Supplies - my favorite and tried-and-true supplies that I use to create my collage pages starting with the basics up to some more speciality supplies that help add color and interest to your pages. ***Finding images/words/phrases that work for you. What my favorite magazines are and why, plus ideas on finding almost-free/free sources to use in your journals. 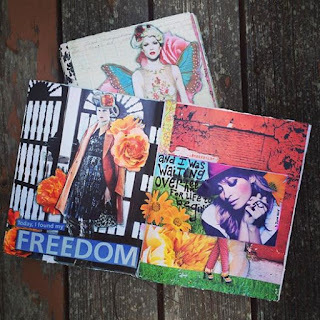 ***Creating a collage journal page. I will take you from the very start of choosing an image to finish as I create a page in my collage journal. ***Creating artist trading cards and postcards. Working on a much smaller scale to create fun cards to trade and mail. ***Collage on the Go. How to put together a travel collage bag so that you can do collage anywhere, even if it's just in a different room of your house! I would be so thrilled if you decided to join me in July as I share with you my tips and tricks to putting together wonderful collage pages! If you would like to purchase my workshop, please click here and you will be directed to a link at Rhomany's blog that tells you how to get registered for her site and purchase my workshop. I am thrilled and can't wait. I've tried using the name of the dog you gave me, but keep getting an error message that it's not correct. This sounds like a wonderful class and I am looking forward to it! It was a little difficult signing up for the Rhomany's Realm, but the dog name was the magic trick. Thank you so much! I paid for the course but unable to register. What's the dogs name? Sorry for the confusing with signing up! Hope that I did everything right, just joined the class and can't wait till tomorrow!!! Hi Cindy, It's not you it's me. :-( I have sent a welcome video out to everyone a few times and some people are getting it and some are not. I even signed up for a new email client and sent it and I'm still having a problem. You are totally in the classroom and ready to go! I am so sorry for all of this craziness! I've been trying to contact people but it's like the gremlins have taken over my laptop! Please let me know if you have any problems! Thanks! Dianne, I'm having the same issue. I'm paid and registered at Romany's, but I've received no information about the course. It's hard to get these things up and running but I try to let instructors know the specifics so that troubleshooting is a little easier . Debbie, If you paid and registered in the forum then you should have access. I am so sorry for all of this confusion! I am a guest teacher in this forum so I do not know all of it's ins and outs and why things are behaving they way that they are. If you go to the main forum page you will see a place to click on to access my workshop. It's in the upper left side. If you're still not able to get in could you please email me at: farmgirlmom@gmail.com? Thank you so much! I think you are losing a lot of potential student's because Rhomany's site is just too cumbersome to manuver. I found the dog's name. I registered on her forum. Pretty sure I became a member. Now I can see the screen that supposedly has all the classes offered. But I don't see any mini-course options where I can sign up for just your class. There's one for the total package of When Frogs Sign which I don't want. And then some other mini courses... but not yours. Too bad. I would have loved to take it but too many hoops to jump through here. Hello Dianne, is this workshop still available somehow ?